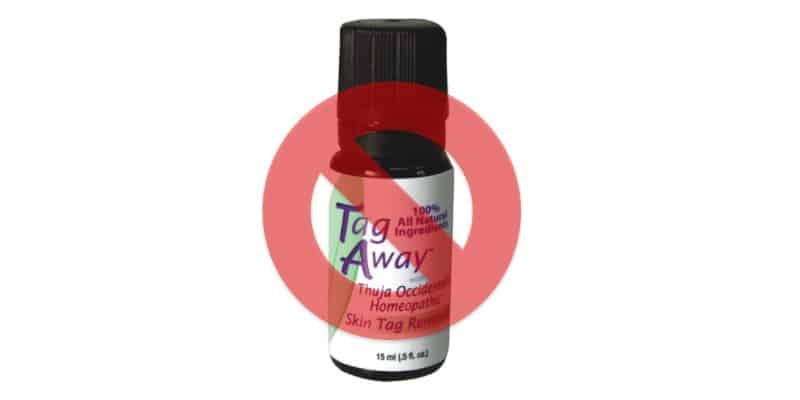 Tag Away is a new, as-seen-on-TV, product that purports to remove all shapes and sizes of skin tags. Skin tags, medically known as acrochordon, are benign fleshy growths that form in areas where the skin forms creases, such as the neck, armpit, and groin. They may also occur on the face, usually on the eyelids. It is believed that skin tags occur from skin rubbing up against skin, since they are so often found in skin creases and folds. Sometimes skin tags rub off and fall off on their own. Tag Away is supposed to work by applying the solution to the skin tag daily until it dries out the tag. One of the main active ingredients in Tag Away is the essential oil of the Thuja occidental tree, which grows naturally in wet forests. During the 19th century, Thuja was used as an ointment for the treatment of warts, ringworm and thrush. Despite it being rich in vitamin C, organizations such as the Natural Medicines Comprehensive Database (NMCD) have since found there is insufficient reliable information to determine this active ingredients effectiveness. The Tag Away solution reportedly smells foul and it takes 3-8 weeks before the tag falls off. However, there are countless reviews indicating the tags simply don’t fall off. Unfortunately for consumers, the refund policy is only for 30 days, which is misleading as it’s advertised that it takes much longer than that to work. Finally, it should be noted that SkinTagTreatments.Org did not give Tag Away any awards or accolades in their most recent product evaluation and review, which means the organization does not endorse Tag Away. So if Tag Away is less than effective for the removal of skin tags, than what is the safest and best method available? Dermatologist and reputable laser clinics remove skin tabs by excision, ligation, cauterization, or freezing with liquid nitrogen. At Inkfree, MD we use a method known as electrodessication, which is a form of cauterization to safely and gently remove the skin tags. An electrical current is applied to the stalk of the skin tag, destroying the blood supply. Over the course of a week, the tag will gradually fall off. Larger tags may require an additional treatment. Most people will feel a slight stinging sensation and numbing cream is available upon request for more sensitive patients. Like all of Inkfree, MD’s services, our skin tag removal is safe, effective and very affordable. Call us today at 832-478-5669 and be free of skin tags once and for all! Does apple cider vinegar remove skin tags?